The Oconee County Board of Commissioners asked the members of the county’s Industrial Development Authority to study the feasibility of changing the county’s approach to zoning as a way to attract industrial development to the county. The Development Authority recommended instead that the county should create one or more industrial sites each between 25 and 75 acres in size and that the county should make sure those sites have needed infrastructure for development. Tomorrow night, Rick Waller, chair of the Development Authority, is scheduled to make his report at the agenda-setting meeting of the Board of Commissioners. The meeting starts at 7 p.m. at the courthouse. Zoning “is not the key issue for industry,” Waller is expected to say, reflecting the report he is delivering to the BOC. While they have not been specific about how this might work, the idea is to get land ready for development by deciding, even if the owner has not asked for change, that certain land in the county should be used for industrial sites and designating those sites in some fashion as prezoned. The pair pointed to the county’s success in landing the Caterpillar plant on what is called the Orkin Tract, which straddles the Clarke and Oconee county line at Bogart. That tract had been zoned for industrial development for many years before Caterpillar decided to locate on it. The owner was paying taxes based on the land’s commercial value rather than the taxes that would have been paid had the land not been zoned and ready for development. The BOC asked the Industrial Development Authority at its April 2 meeting to study prezoning and its potential in spurring industrial development in the county. The IDA took up the assignment on April 8 and sent it to a subcommittee. That subcommittee produced a five-page report that Waller said last Thursday he would present to the BOC tomorrow night. According to that report, the subcommittee held five meetings, many of them with county officials, before coming up with 11 “findings” and three “recommendations” to the BOC. The subcommittee said that search consultants for industrial developments do not deal with zoning regardless of how quickly it can be done. Zoning has to be final, and predesignation of land as ready for zoning will not be sufficient, according to the report. Commercial developers, in contrast, are willing to go through the zoning process, according to the subcommittee report. While adequate commercial sites in the county are available for rezoning, the county lacks industrial sites of from 25 to 75 acres that are ready for development, the report said. The county’s only industrial park, in Watkinsville on SR 15, is at capacity, according to the report. The subcommittee said that the county should identify and establish one or more industrial parks with adequate utilities and transportation access and make sure the land already is zoned for industrial use. The county should investigate the best combination of public and private ownership and financing of these sites rather than depend entirely on market forces, the report said. “While streamlining the rezoning process would be a good thing and would likely benefit commercial development, it would not significantly impact industrial development,” the report said. The Industrial Development Authority has had no success until just recently with development of the Gateway Business Park not far from the Barrow County line on SR 316 between Pete Dickens Road, Aiken Road and McNutt Creek Road. The 120-acre-plus park consists of two parcels of roughly equal size that are separated by land not owned by the county. The Development Authority also owns three smaller parcels on the south side of SR 316. The county rezoned the land north of SR 316 more than 10 years ago using a special Technology Business zone. The three small tracts south of SR 316 total about 18 acres and are zoned for agriculture. The property has limited roadway access to SR 316 and is not fully served by utilities. 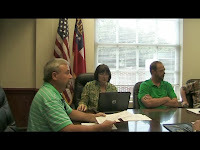 In a called meeting on June 26, the Development Authority agreed to enter into a contract to sell Rooker LLC approximately 12 acres at the corner of Aiken Road and McNutt Creek Road for $300,000. Rooker, based on Tucker, is a design and construction firm specializing in industrial development. Oconee County Development Director Rusty Haygood told me a little more than a week ago Rooker has a client for the site, but he would not identify that client. At another called meeting on July 24, the Development Authority agreed to sell the 18 acres south of SR 316 to Andrew Clyde, who owns Clyde Armory, 4800 Atlanta Highway near Bogart. The sale price was $203,472.00. Haygood also would not indicate what Clyde plans to do with the site. The Development Authority went into executive session at its called meeting last Thursday to discuss land transactions, but it took no action when it returned to open session. It was at that meeting that Waller said he was ready to make his report to the BOC at tomorrow night’s meeting.